Meet Jonathan Busarow, our Executive Artistic Director. Jonathan grew up outside of Dayton, OH in a rural town. He attended Valparaiso University where he majored in Voice Performance. It was there that he met his wife, Nicole. He attended The Ohio State University where he earned a Master of Music in Choral Conducting and education licensure. His summers were spent at Capital University where he studied the Kodaly Methodology (how to use solfege on steroids). He had the chance to go back to Valparaiso University where he served as the university choir director while his teacher was on sabbatical. It was after this, in 2012, that Jonathan and Nicole moved to Fort Wayne so that he could work with the FWCC. 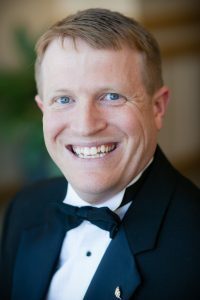 He also works for IPFW in the music department, teaching choral music education, as well as directing the choir at Emanuel Lutheran Church in New Haven. 1- What do you like best about working with FWCC? Rehearsal time is how I end my work day, and it is always a highlight. The opportunity to work with students who work as hard as our students do, and then to see the rewards of them learning a new skill, having an incredible performance, or watching the friendships emerge from kids who otherwise wouldn’t have met – it’s a pretty incredible thing! 2- What is your favorite FWCC memory? Now THAT is a hard question! How to pick a favorite… Every tour has had its own incredible moments and every Holiday Pops performance has been memorable and unique. If I could just pick one performance to stand above the rest, it would have to be the Concert Choir performance at the American Choral Director’s Association conference in Chicago. It was a special moment for all of us on the stage, and a performance that our audience of choral musicians rose to their feet in appreciation of (not something that happens very often at those conferences). 3- How would you describe the culture of FWCC? It is my hope that the FWCC has a “family-like” culture. Our students, parents, and staff support one another in ways that are nearly impossible to quantify. I’d like to share one story about how this organization demonstrated that in my own life. Almost four years ago, our oldest son Simon was born. He arrived five weeks early, which meant a lengthy stay in the NICU at Lutheran Hospital for our family. The staff was incredibly supportive and allowed me the time I needed to be with my wife and son. When I came back to rehearsals, students had created not one, but two books for Simon. “A Few of My Favorite Things” which played on the Sound of Music, and a picture book of our solfege hand signs featuring our singers. Today, both of our boys use these books, and it’s a reminder of the supportive and caring place that is the Fort Wayne Children’s Choir. 4- Why should a child consider joining FWCC? Any child who likes to sing should be here! We help children learn to use their voices in a healthy way while we also instill a music reading ability so that members of the FWCC have a life-long skill. What could be better than singing for your ENTIRE LIFE?! ?